FC Barcelona will be taking on Juventus in the final of 2015 UEFA Champions League final on Saturday, 06 June in Berlin in their pursuit to win the treble under new manager Jose Enrique. Its a massive game for both sides where Juventus are heavy underdogs at odds of 12/5 and thats largely down to Barcelona’s typical possession game with superb attacking threat. Neymar, Messi and Suarez has scored around 120 goals between them and it is hard to bet against Barcelona if all three are fit for the final. We take a look how both teams might lineup and our predictions for the match. FC Barcelona might go with the same squad which took on Athletic Bilbao in the final of 2015 Copa Del Rey. All front Messi, Suarez and Neymar are fit while we can expect Ivan Rakitic, Sergio Busquets and Andres Iniesta starting in the midfield trio while Dani Alves has turned his form around and should start at right back while Jordi Alba on the left back position. Gerard Pique and Javier Mascherano has been magnificent this season playing together in central defense. 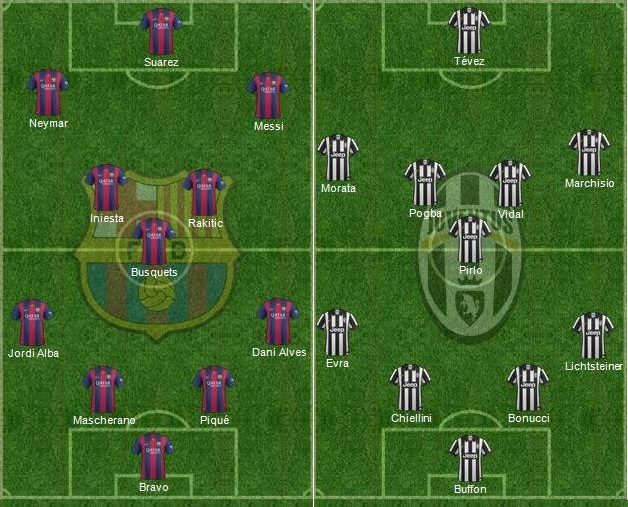 Juventus On the other hand will have to be careful not to commit too many players in attack so I can expect a packed 4-5-1 formation to deal with Barcelona possession football, where Carlos Tevez to play upfront on his own and Alvaro Moratta should play on the left sided midfield along with midfield trio of Pirlo, Vidal and Pogba. While Claudio Marchisio will be a floater who can play on right side midfield or just behind Tevez. Evra, Giorgio Chiellini, Banucci and Stephan Lichtsteiner should make the back four. Andrea Barzagl is doubtful and might miss the final. These are the expected starting lineups while the confirmed lineups should be available here 1 hour ahead of the kickoff. Barcelona are overwhelming favourites but Juventus had a great season so far winning Italian Serie and the domestic cup in Italy and this is one game where every player will be up for it. Juventus lack that world class game chaning talent in the team but they have a quality players on every position in the team. Evra will have to be on top of his game to stop the likes of old foe Suarez and Lionel Messi. Barcelona has enjoyed 70% possession on average in La Liga this season and 61% in europe which pretty much means Juventus will go into the game knowing they wont have much of the ball. So their chance of success depend how organized they are without the ball. The final of Champions League quite often turn out to be game of chess and this won’t be no different but I can see Barcelona getting the better of Juventus solely because how consistent they are going forward. If Barcelona score first Juventus will have an up hill task to turn things around. I am going with a 2-1 win for Barcelona with Messi and Neymar on target. 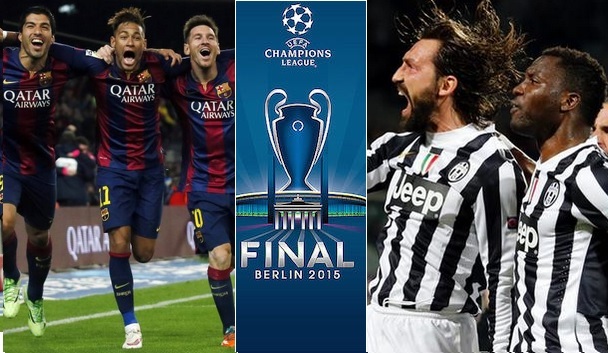 What you think of the final ? whos going to win ? let me know your thoughts in the comments below. No doubt Barca will win this game , with best attack in the world MSN…LONG LIFE BARCA<BARCA MESSI is the Barcelona…. nope, juve will take it home.